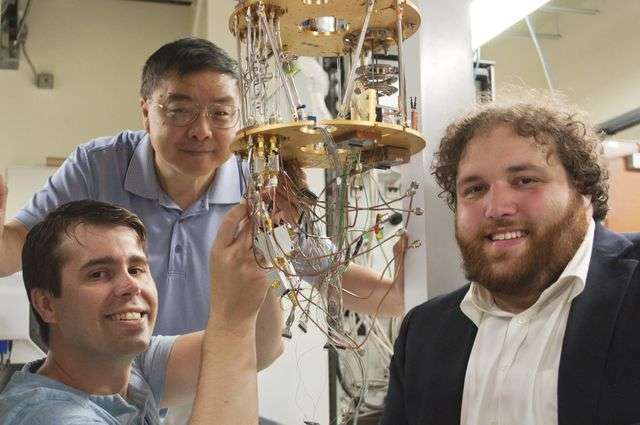 During their research for a new paper on quantum computing, HongWen Jiang, a UCLA professor of physics, and Joshua Schoenfield, a graduate student in his lab, ran into a recurring problem: They were so excited about the progress they were making that when they logged in from home to their UCLA desktop—which allows only one user at a time—the two scientists repeatedly knocked each other off of the remote connection. "It's so exciting," said Jiang, a member of the California NanoSystems Institute. "We didn't want to wait until the next day to find out the outcome." Quantum computing could enable more complex information to be encoded on much smaller computer chips, and it holds promise for faster, more secure problem-solving and communications than today's computers allow. The UCLA researchers' breakthrough was being able to measure and control a specific state of a silicon quantum dot, known as a valley state, an essential property of qubits. The research was published in Nature Communications. "An individual qubit can exist in a complex wave-like mixture of the state 0 and the state 1 at the same time," said Schoenfield, the paper's first author. "To solve problems, qubits must interfere with each other like ripples in a pond. So controlling every aspect of their wave-like nature is essential." Silicon quantum dots are small, electrically confined regions of silicon, only tens of nanometers across, that can trap electrons. They're being studied by Jiang's lab—and by researchers around the world—for their possible use in quantum computing because they enable scientists to manipulate electrons' spin and charge. Besides electrons' spin and charge, another of their most important properties is their "valley state," which specifies where an electron will settle in the non-flat energy landscape of silicon's crystalline structure. The valley state represents a location in the electron's momentum, as opposed to an actual physical location. "Imagine standing on top of a mountain and looking down to your left and right, noticing that the valleys on either side appear to be the same but knowing that one valley was just 1 centimeter deeper than the other," said Blake Freeman, a UCLA graduate student and co-author of the study. "In quantum physics, even that small of a difference is extremely important for our ability to control electrons' spin and charge states." At normal temperatures, electrons bounce around, making it difficult for them to rest in the lowest energy point in the valley. So to measure the tiny energy difference between two valley states, the UCLA researchers placed silicon quantum dots inside a cooling chamber at a temperature near absolute zero, which allowed the electrons to settle down. By shooting fast electrical pulses of voltage through them, the scientists were able to move single electrons in and out of the valleys. The tiny difference in energy between the valleys was determined by observing the speed of the electron's rapid switching between valley states. After manipulating the electrons, the researchers ran a nanowire sensor very close to the electrons. Measuring the wire's resistance allowed them to gauge the distance between an electron and the wire, which in turn enabled them to determine which valley the electron occupied. The technique also enabled the scientists, for the first time, to measure the extremely small energy difference between the two valleys—which had been impossible using any other existing method. "The dream is to have an array of hundreds or thousands of qubits all working together to solve a difficult problem," Schoenfield said. "This work is an important step toward realizing that dream." How much more energy does it (or will it) take to cool a quantum computer?